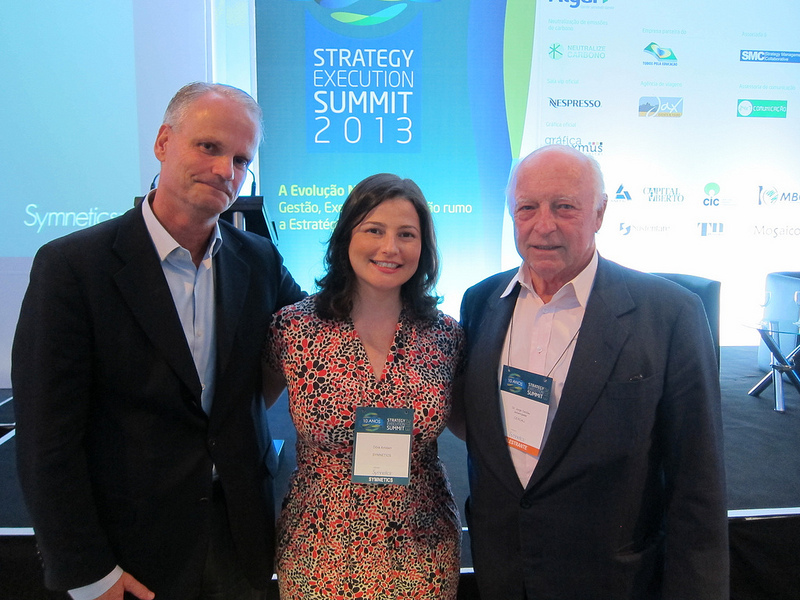 This article follows on from my previous article covering day one of the Strategy Execution Summit 2013 in São Paulo – Day One: The Transition of Business. Before reviewing the day in detail, I thought it would be interesting to hear from Maria Auxiliadora, Director of Education at Symnetics, who was responsible for the event. For Maria, the key to the success of the summit was in her vision of taking delegates through a transformative learning journey, a way of learning which was inspired by Schumacher College, a college famous for its philosophy of ecology and economics. Maria studied at Schumacher College in 2010 on the course The Economics of Happiness, and this gave her the opportunity to experience at first hand a very different style of learning which not only involves the transmission of knowledge, but the personal transformation of the student, in order to enable them to be able to shift their entire mode of thinking, and allowing them to be able to comprehend and make practical use of some very profound and powerful shifts in paradigms. Many delegates remarked how outstanding the summit had been, its depth and personal impact on them, and much of this achievement I think is the result of the vision Maria had in bringing the Schumacher way of thinking and being into a corporate environment in the form of a two-day summit. 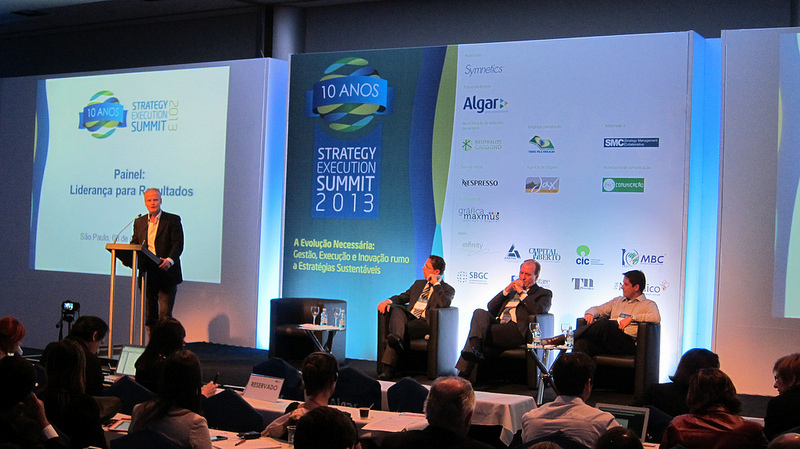 This was the 10th Strategy Execution Summit and for Maria it marked an important turning point not only for Brazil, but for all organisations which are now no longer able to take a liner and static view of strategy, where they can set strategy and the start of the year, implement, and then review at the end of the year, ready for the following cycle. Businesses and organisations are now dealing with a far more dynamic and turbulent environment where the implementation of strategy has to become far more dynamic and responsive. And so they have to now focus on risk management, strategic intelligence, alignment of strategy with projects, and sustainability. Maria structured the summit around this bifurcation, starting with an in-depth look at how organisations had progressed over the last ten years, to a move which looking at the most current successful case studies of the implementation of strategy, ending with a look at the key role of leadership and the keynote speech of Dr. Jorge Gerdau Johannpeter, one of Brazil’s and the world’s most successful entrepreneurs. This was a celebration year, so it was a time to stop and reflect on what we have done and what we still have to do. The way I designed the event in terms of the sequence of lectures, panel sessions, and workshops, the idea was to evolve ourselves. We were able to reflect on the past, what we should have done differently and what we did well, and so this is part of a growth process, seeing what is new and what still need to learn. I wanted to create a more integrated vision. The main objective of the summit, which is what I have been trying to do year after year with the courses we give at Symnetics, is that everything is integrated. Risk is not a subject which can be compartmentalised. Likewise with strategy and human resources etc. In fact the idea was to show that the company is a whole system, everyone is responsible at some level for everything. The agenda and the way the summit was presented, ending with Dr. Jorge Gerdau, who has this systemic vision, was designed to help develop this understanding. 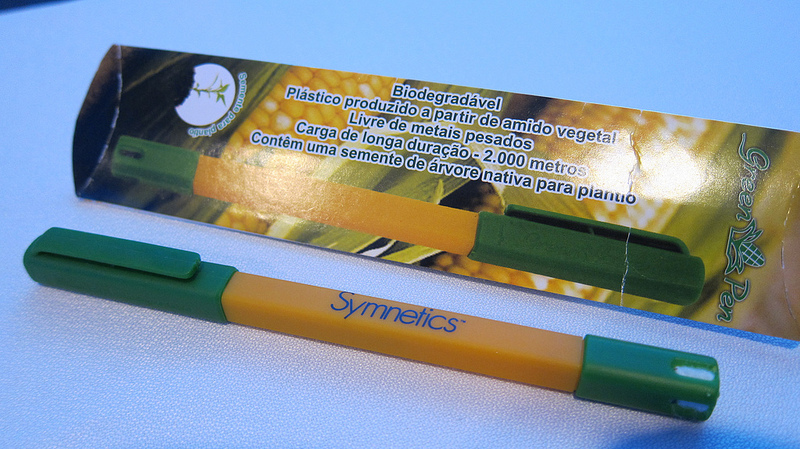 All delegates received a biodegradable pen which also contained a seed which delegates would be able to plant. Given that the way of seeing of organisations is becoming more dynamic, more open (understanding the relationship between an organisation and its ecosystem of stakeholders and other organisations it interacts with) and the need to make sense of an ever-changing future, for Maria there is an obvious overlap between forward thinking strategic objectives, and the deepest sense of sustainability which is focussed on the resilience and adaptability of the company. Hence day two opened with an extremely thought-provoking presentation by Hugo Penteado, Chief Economist and Head of Ethical Investments at Santander discussing Ecological Economics. Maria invited Hugo not only for his profound knowledge relating to sustainability and what it really means, but also for the fact that he is applying this in his work and personal life, for example cycling to work, something he spoke to us about with humour given the dire traffic conditions in São Paulo; “I always feel safer when the traffic is at a standstill. It’s when the traffic is flowing I have to worry.” His theme was ‘ecological economics’ and his key message was that we really have to understand what we are doing in this world, and the consequences of our actions. We live in a closed system, so we can not throw things away, we just put them in another place. The principle of nature is to always try and recycle, even poisons, so we have to be more conscious about what we are doing. If we are going to talk about reorganising the facts, then we must talk about this as a creative reorganisation because it does not just simply reorganise existing elements but changes their meaning. Failure to recognise this fact is what makes genuine paradigm shifts truly difficult, and which is why Maria places so much emphasis on the summit as a learning journey, and not just the transmission of information. Roberta’s talk was then followed with a very interesting case-study by Artaet Martins from Ecorodovias (their name translates as EcoHighways), one of Brazil’s most important transport infrastructure and logistics companies. Like many of the case studies from the previous day, dialogue is a critical tool for Ecorodovias for overcoming their many complex challenges, especially as they work closely with the government, NGOs, local government, mayor’s offices, and local communities. It was interesting then to see how this theme was taken up with the first panel session of the afternoon which examined how to develop a strategy for industry federations and associations. Here the challenge is how to develop a strategy in which groups of competitors has to discuss what they have in common. It is a complex environment in which dialogue is needed to find the common purpose. The final panel session examined leadership for results, and this was interesting as there were two CEOs from the private sector and one Secretary from the Ministry of Transport, Dr. Américo Almeida. They discussed what exactly it means to be a successful leader: communicating well, understanding the future and seeing the organisation as a whole. Dr. Américo Almeida noted how in Brazil in the public sector, as in most countries, there is not a meritocracy, and as such it can be a difficult environment to manage, but that environment was changing for the better. As a keen mountain biker, it was wonderful for me to be able to have a short conversation after the session with Henning von Koss, Head of Levorin, the only bicycle tyre manufacturer in the Americas. During the panel session on leadership, Henning talked about ethics and values were a great deal, making the point with the other speakers that a true leader who asks for ethical behaviour has to be the epitomy of this. If a leader does not practice what they say, the organisation will soon get into trouble. Closing the summit was the keynote talk by Dr. Jorge Gerdau Johannpeter, one of the most visionary entrepreneurs in the world, and president of Gerdau, the largest steel producer in the Americas, with operations around the globe. In the 1980s he started to bring quality management processes to Brazil, and is very focussed on how to improve not only Gerdau, but also Brazil. He is a mentor of the educational programme Todos Pela Educação, and he now works in the Federal Government, helping the government to develop and implement their management systems. The idea is to create fundamental long-term improvement programmes not linked to any particular political party, but “state programmes” which are designed to be implemented and remain independently of who is in power. Brazil has suffered in the past as many policies are cancelled when a new power is elected. Maria invited Dr. Jorge as not only does he have a holistic vision (he mentioned Peter Senge and cybernetics in his talk) but also he was a speaker at the first Strategy and Execution Summit ten years ago. Dr. Jorge spoke about what he had done in these last ten years, in conversation with Mathias Mangels, the founder of Symnetics, and he spoke a lot about his vision as a leader, the importance of process, and also the fact that leaders should focus not on growth and financial results, but on excellence and being the best. If you are excellent at what you do, growth and financial results will be a natural consequence of these. A company has to really listen to their customers, as opposed to thinking that they do know what their customers think. They have to really look after people, as it is people who make a difference. So this is why he worries about education, and why both organisations and economies need creative people who can think differently and question things. Overall Dr. Jorge seemed to make a huge impact on the audience. This was partly due to his leadership skills, and the fact that what he says is entirely aligned with his actions. For Maria, another very impressive attribute of Dr. Jorge is how he is an optimist, noting how Dr. Jorge said that “Brazil can really be a very strong country, not in the distant future, but in ten years. There is a lot to improve, but it is not impossible”. Perhaps there is a tendency for Brazilian people to only concentrate on the negative, too much on the bad aspects, but since Dr. Jorge has both a background in private enterprise and government projects, his words have a very high impact on people. He is neither naive, and he is at the centre of power in Brazil. This is what Brazil needs, more inspiring leaders. Since being responsible for the summit in 2011, my aim was to really create a new kind of event. Not an event just to show best practice, not one where people just go to listen speakers, and not just to learn about new methodologies, but one where people could listen to real people discussing real problems and how they found solutions to their difficulties. So the most important point was to create a dialogue, through workshops, panel sessions, and so there was a lot of space and time for people to develop their networks. The idea was that people would be exposed to things that normally they would not, in terms of the reflections and themes, and how they are all integrated. I really want to see this work continue after the summit, and I saw many people making new contacts, and also discussing issues with the lectures, many of who stayed at the summit after their talks to converse further, answer questions and to develop relationships. The principle of Schumacher College is transformative learning. The idea of the college is to create a very deep learning space, and to prepare people to really understand and to really help them to change their mental models, to see things differently, and in a better way. 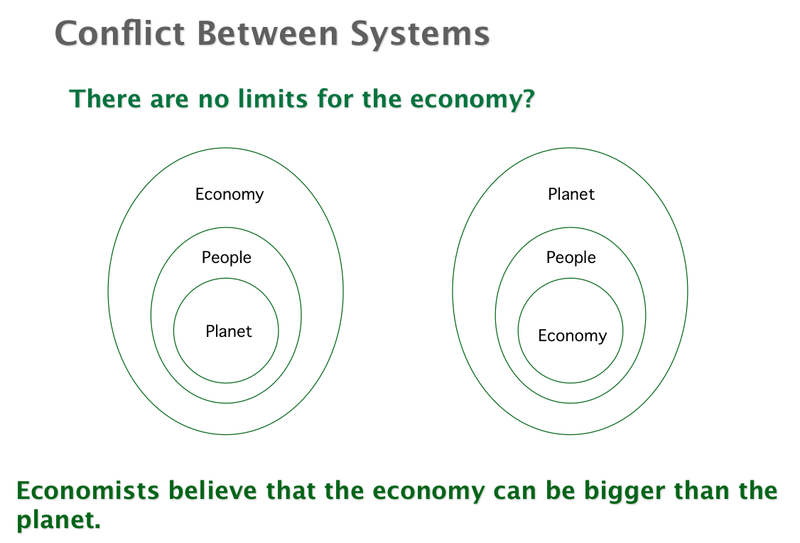 The whole system is about creating connections between people and also understanding process and strategy systemically. The summit, in the way it is created, and the way I conceived it, was in the Schumacher way of learning, adapted to a large-scale event. The idea was therefore to create a transformative event, creating connections between people and connections between knowledge. I have mentioned many times before how especially as a Brit, or maybe European, I have found it quite embarrassing how speakers often come to Brazilian conferences and whose presentations make no mention of Brazil or the Brazilian and Latin American culture and context. Obviously David Norton and Robert Kaplan were here presenting, but Symnetics have been working closely with them in partnership for more then ten years, and they know Brazil well, especially as Symnetics have done so many projects in Brazilian companies and government ministries, implementing Balanced Scorecard, developing their strategies and improving processes and projects, affecting not only customers but the life of many Brazilians in many states and municipalities. At this summit it was very striking how strong the desire of speakers was to share with the audience their own personal as well as organisation’s learning journeys. I would obviously like to thank both Symnetics for my invitation to this major event, and also Infinity Conferences and Exhibitions who helped organise the summit. As I said at the start of my article on Day One of the summit, it is a shame that there were no members of the international press here to really help showcase to the rest of the world just what best practice in strategy looks like in Brazil, in both the public as well as private sector. There were many both educational and also inspirational projects showcased, and I hope I have managed to show just a few of these in these two articles. Thank you Simon for taking the time to capture and share what reads as an amazing event. Please let me know if you would like a keynote for next years conference with an Asian perspective. I run Bridges Business Consultancy Int, a specialist in Strategy Implementation.